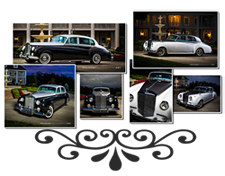 Take a trip back in time and in the lap of luxury with limousine and chauffeur services by A Regal Carriage Company in Knoxville, TN. Serving the entire Knoxville area, we offer an array of limousine and shuttle services for corporate events, weddings, anniversaries, proms or airports transportation. Indulge in luxury and feel glamorous in one of our high-end British cars. Come in and treat yourselves and we will do the best to make you feel like royalty!